Spend a sensational summer vacation helping Rangers run Pinecreek Hills National Park. It’s the park’s centennial year and it’s bigger and better than ever. Fly the floatplane back from HQ, see the NEW Centennial Miniature Railroad, award winning bridge, cosy Craft Café, Eagle Pass chairlift and much more. Explore stunning waterfalls, enchanted caves and other gorgeous outdoor locations. Enjoy beautiful scenery, have barbecues, even rescue an orphan bear cub. See the spectacular Blue Angels airplane display and parachutists dropping onto Ranger Field. Spot 100’s of animals, birds, fish and other wildlife. Protect the environment and get Souvenirs and awards along the way. 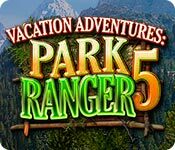 Vacation Adventures: Park Ranger 5 is rated 4.7 out of 5 by 38. Rated 5 out of 5 by upsysydaisy from My Bags Are Packed! Pinecreek Hills, Here I Come! The Park Ranger games are so much fun and so busy. I own all 5 of them and love them all. 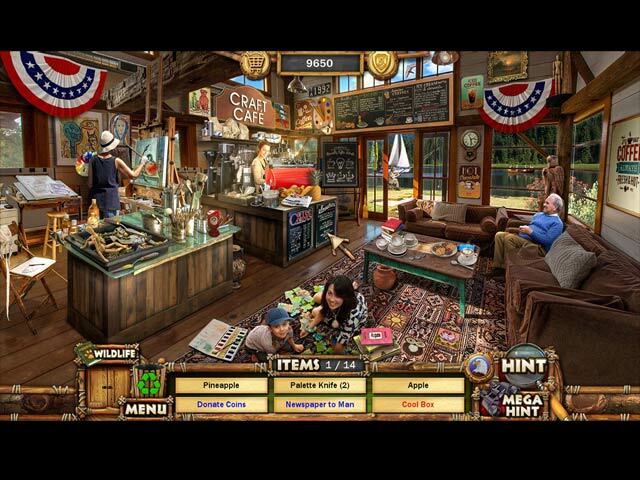 There is a good variety of games and puzzles, the hidden objects are quite challenging because many are small and all are well hidden. I just love that we get a satisfying challenge without pulling our hair out from frustration. Though I must admit to using my trusty old magnifying glass quite a few times. Using real people in the game is such a quality feature and Pinecreek Hills is so scenic. It gets more beautiful the further you go into the park and it is filled with all kinds of wonderful sights. It is a visually busy game and even the background is filled with much activity and wonderful sights. Just remember to take the time to enjoy it, as it gets overlooked if you are not aware that it is of importance to the overall enjoyment of the game. 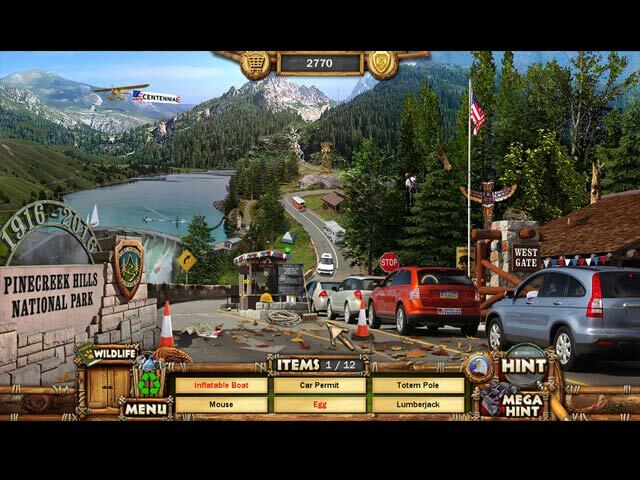 Park Rangers is a great learning tool for adults and children and has wonderful replay value. I really appreciate the helpful change in Park Ranger 5, which is the recycle can shows us that it is full and we can stop searching for the trash items. In the previous games I just kept a keen eye on the count and hoped I had collected everything. Which was not a negative, just sometimes a little frustrating. I enjoy everything about Park Rangers, they just keep getting better and better. A quality game from start to finish and runs smoothly, never any slowness, stalling, freezing, etc. The color and graphics are outstanding. The equipment and buildings, scenery (like the park visitors) add that special pizazz because of the realistic pictures it all provides. 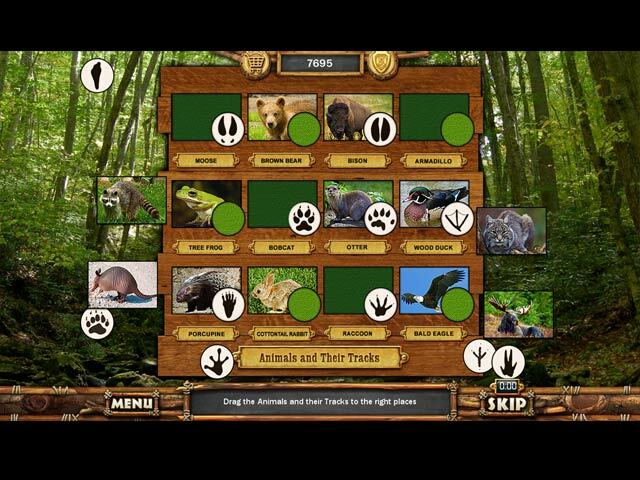 Love the wildlife, the silhouette wildlife collectibles, achievements, shopping with your earned coins. I do seriously hope we have more and more Park Ranger in our future!! There is such a shortage of light-hearted, fun, family oriented games on Big Fish. I play the other games in spite of their "darkness" because I love playing games very much. But I know that all the darkness & evil, monsters, maniacs, mad doctors, etc is not healthy for anyone all the time. Park Rangers (and there are other innocent, fun Big Fish games) provide that very necessary and welcome change from all that heavy stuff ! Obviously, I highly recommend this game...it is easy to enjoy. God Bless ! Try Vacation Adventures: Cruise Ship. Same wonderful get-away. Instead of entire vacation in national park, enjoy various beautiful places via huge oceanliner. Fun !! Rated 5 out of 5 by tutortime from Love the series. This game has all the expected features of the series. The scenes are very interesting and the mini games enjoyable. Great use of a free coupon. Rated 5 out of 5 by stonebull7 from IT'S THE MUSIC Fun gameplay like the preceding games of this ilk but this game's music is incredible...The guitar work was infectious! Rated 5 out of 5 by plumblsm from They Did It Again I love this series (along with Cruise Director). I cut my HOP teeth on Little Shop of Treasures. Remember when HOPs weren't adventure games? This has great graphics and pleasant music. The storyline makes sense and some of the most challenging scenes.In each scene you have to find not only the objects on the list but wildlife and trash. this really adds to the challenge and enjoyment. There are mini-games, but they are fairly easy. I think this is one of the best game series around. Enjoy everyone! Rated 5 out of 5 by lois1231 from So happy. I was so thrilled to see this game when I looked at the new games. This is one of my favorite series. I get tired of all the dark games and having to run back and forth between areas to solve puzzles. This is pretty much pure hidden object which I love with puzzles thrown in which I also love. The special effects are amazing. Some of the items are hard to find but not enough to be frustrating. I hope they continue to make more games like this. Try it. You might surprise yourself and like it. Rated 5 out of 5 by iluvpurple from Love All of this Series I have bought all these Park Ranger and Cruise Director games. Both are the best ever. I find no need to try them before I buy them...I know they will be excellent as always. I am eagerly awaiting the new Cruise Director 4. But I bought the new Park Ranger yesterday and as usual, I love it. I have no dislikes. Only that the game isn't long enough. Am looking forward to #6!!! Rated 5 out of 5 by Marja67 from The Best ever! Love these games. I own all of them. The music is skipping at times but that's OK. Pretty scenery, wish I was there. Clean up the campgrounds from trash, find all the animals and play puzzles in between. Hope they keep coming! Rated 5 out of 5 by ZipperK from Glad to see this This series never disappoints. As with all of the others it is very well done and very enjoyable. I didn't even do the trial because the minute I saw the game I knew I would end up buying it. So refreshing for those of us who like the older HOG games which are few and far between. Hope there will be more like this. Rated 5 out of 5 by graciesmith7 from Camping Without the Mosquitos! I have all of Casual Arts games and I love them-this new one too. The scenes are impossibly bright and cheerful and amazingly immersive for a simple game. The HO's are just enough of a challenge, fun mini games, and some recurring characters. Isn't that mom and kids the ones from the Christmas series? Always look forward to the Ranger series; they are so relaxing to play, with beautiful graphics that make you feel like you are there. Only vacations I get to take and I love them. Now it's time for another cruise!!! I definitely recommend for a leisurely experience. Rated 5 out of 5 by Talidog from Yippeeeeeee!!! I LOVE all the Park Ranger games!!! I was so excited when I opened Big Fish tonight and saw it. This is great! The seek and find are challenging but not frustrating. These games are just straight up fun! Rated 5 out of 5 by JesusFavorite from Another Great Adventure This is the fifth one of these games I've purchased and I enjoyed each one, but this one, I believe, is longer and some of the puzzles are challenging, to say the least. If you like hidden object games that are not dark and depressing, this is a must-have, along with the other four. Rated 5 out of 5 by Flamingo_Lady from C@sual Arts does it again! I'm in love with all of the vacation games, and this one is so good so far. The graphics are beautiful, the games are challening, and it's very relaxing. I will buy every game that Casual Arts makes. They are top notch. Rated 5 out of 5 by cowclaudia from Best of the five I usually gave an average rating on the other four since I never enjoyed the mini games and some of the HOG were miserable. Love this one. I actually am enjoying the mini games, the hidden objects were a challenge at times but not impossible and loved the sound effects especially the wind blowing and the frogs. Hope they come out with a sixth in the series. Rated 5 out of 5 by snapnhiss from I love these games I especially love the holiday ones they make... the graphics are a mix of photography and photo realistic artwork and the game play is actually rather challenging. You have three things you have to find on each level: litter, an animal from a silhouette box and the objects on the list. The litter can be very challenging to find! The game starts off fairly easy and gets more difficult, particularly the puzzles between HOS. These are pretty, relaxing and enjoyable and I've replayed all of them many times. Rated 5 out of 5 by kdblueey from NEW FEATURES ADD A LITTLE SOMETHING TO AN ALREADY FANTASTIC SERIES! BASED ON 30 MNS OF DEMO PLAY: I only played 30 minutes of this wonderful series, because I wanted to see the NEW features the game has to offer (and also give my review), in comparison to all of the previous versions (which I have all of them). As always, here are my PROS & CONS: PROS 1. (NEW) You only have to find 3 wildlife animals (at least that I found in the 30 mins of gameplay). 2. When you've collected all of the trash, the trashcan fills up to the top (I'd much prefer the previous version where the lid would close when you gathered all of the trash, because as anyone who has played this series before, finding all of the trash is the hardest to find (sometimes). 3. (NEW/DIFFERENT) The music is different. If you like the guitar, then you'll love the new music. 4.As far as the 'mini-games' (I'll call them that) that you play after finishing a particular scene, I haven't YET noticed anything new. I played the beginning of the game, where you had to place the various sections on the park map (this is a standard on all of the VA, PR's games). There was a puzzle that you had to put together, and another one where you had to turn the pieces around to form a picture of some sort. 5. (NEW) After finishing a scene, you get three stars (one white, one gold, and one light yellow). These show up in the box that tells whether you found all of the wildlife, the trash, and all of the items, along with your score. CONS I could find NO cons in the fantastic series that has delighted all of us Big Fish game players, along with the Vacation Adventure: Cruise Director games. This is an instant buy for me. It is the type of game where you can play over and over again, without getting tired of it. As always try the demo first before you buy. Enjoy :) I highly recommend this game. Rated 5 out of 5 by Kimmycoo from Sooo Excited! I was so thrilled to see part 5 come out! I immediately buy these as soon as they are available. There are a lot of new scenes in this one and I am just thrilled as usual at the beautiful graphics, the great music and the cool game play! I sure hope the developers bring out a new Christmas one too! That should be part 6 I think. Those are deff the highlight of my Bigfiish game year! I love, love, love these games! I wish more developers would make such games as these. I feel like Im right there, in the scene... I love the Park Ranger series, the Cruise Director series and any of the holiday games, especially Christmas! Thank you developers!!! Rated 5 out of 5 by pennmom36 from WHO'S READY FOR A VACATION AT PINECREEK Vacation Adventures always put's a smile on my face, because I love the familiarity of this old school HOP, and I'm sure you love it as well. The rangers at the Pinecreek Hills National Park are gearing up for the the 100th birthday celebration of the National Parks Service that was founded in 1916! The Park is going to be busier than ever so there's no time to waste finding missing items, cleaning up the park, and finding lost wildlife. There are seek and find puzzles in scenes all around the park, and each scene has several wildlife animals to find that are shown as silhouettes in a box to the left of the word search bar, when all animals have been spotted, the box will close. You will also recycle trash that is laying around, such as plastic bottles, crumpled paper, bottles and cans, when all trash has been found, the recycle can icon will be displayed. You will earn an Eagle Eye achievement if you don't use either the hint or mega hint feature. The Mega hint will show you the location of every item left to find. You earn a Bronze star for completing the search, a Silver star if you find all wildlife OR all recyclable items and a Gold star if you find all wildlife AND all recyclable items. Words listed in blue require an interaction of some type, and words in red are hidden inside or behind things, requiring you to click on an item to open it or move it, which will reveal the hidden item. Many of the scenes have an area that zooms in which will have several items within, that are on the list. Levels can be replayed at anytime to better your score or locate items you missed the first time. My favorite feature in the Vacation Adventures games are the abundance of Mini Games available after each search, such as, Spot The Difference, Word Search, Match Two and several different styles of puzzles, rotating tiles and putting together maps and pictures with different shaped pieces. You can use the money you earn playing the game, in the Souvenir Shop to purchase 16 vacation park souvenirs, everything you purchase is kept in a display case in the Souvenir Room, and you can earn up to 20 Achievements, happy camping, enjoy! Rated 5 out of 5 by iloverainbows from I'm off to my delightful cabin again. Fishing, camping, biking, sigh...so much to do, so little time. What can you say. Go out and commune with nature for a peaceful, but active adventure. Just love this series. And the graphics make you feel you are right there. Sounds and music perfect. I have this whole series and am never disappointed with the informative and delightful adventures we all can get into. Sometimes hard to find the garbage, but not impossible. The games and puzzles along the way are just enough to keep you playing when you know you should be doing other things. I find this series addictive and amazingly fun. Please try this series and see if you too will become a wildlife camping buddy. I also love the change of seasons and the wildlife you see around then. So pack your self and family up...meet you all at the gate and away we go!!!! Rated 4 out of 5 by joeceleb from Fun without much stress This is a true hidden object game....not so simple thought...items are really hidden so you need to take some time to find them...but it's fun...the bonus games are fun also but the time limit they want you to complete them in is almost impossible...especially the puzzle at the end which I enjoyed doing but could no way finish it in 3 mins or less..overall a fun game to play. Rated 4 out of 5 by sallylhasa from A little too easy I like this type of simple game where you just search for hidden objects and solve puzzles, but this one seems a bit easier than the previous games in this series. Only in the last few scenes were there some seriously hidden objects. However, it's still an enjoyable game and pastime. Rated 4 out of 5 by Kafinkee from As Expected If you've played any Park Rangers game before, you know exactly what to expect. I could do without so many tedious, easy puzzles between hidden object scenes - they take too long to complete without offering any challenge so I soon started hitting the skip button before I finished them. A new soundtrack would be nice, too. These are great games to play together with young children who enjoy searching for the often well-hidden items. And of course, I have fun playing a good old-fashioned HOS game like this myself every once in a while. The scenes are beautifully illustrated, have just enough challenge so it's a perfect game for when you feel like something fun and relaxing. The story's interesting based on the demo. I'm always happy when I see a new one's been released. A purchase for me. Rated 4 out of 5 by dancemom1 from Excellent HOP! Hello friends! Well, we have #5 in this series and I have them all. Yep, just purchased this one as well. I really like this series, along with the Vacation Adventures: Cruise Director games, this one makes 8. If you like straight HOPs, then you will like this series. The dev definitely cleaned up the scenes in this addition. They are still somewhat cluttered, but items seem a little easier to spot. You still have to find wildlife and garbage for extra points. The garbage can be a carton, pizza box, coffee cup, empty bottle, etc. This is where the challenge is in these games. I have the need to find them all. The best part is, if you don't find everything the first time, you can replay the scene and find it. You don't lose the money you already earned and you don't have to start all over finding all the collectibles, just the one (s) you missed. The faces used to creep me out...the eyes were very weird. That has been fixed and is much better. The people still look like mannequins, but not creepy. I do wish they would upgrade the music, which is quite annoying...I either turn it off or way down. I like how you play a scene and then a puzzle each time. The puzzles are varied between a replace pieces on a map, turn pieces, compare pictures, etc. Each scene and each puzzle that is completed earns you money to purchase souvenir items from your vacation. The more stars you earn, the more money you earn, the more items you can buy. Yes, it may be a silly little game, but it is quite relaxing to me and a very nice change from the dark, dreary, bloody type games we seem to get a lot of lately. The only draw back to me was the seemingly long lag between scenes. You should be able to hit enter or the space bar to speed things up a bit, but not a deal breaker. I think most players will find this one a nice game for a lazy quiet day. As I said, I already bought this one. As always, try it for yourself and see what you think. We all have different tastes in games and you may not care for this one at all. Thanks for the reviews. Rated 4 out of 5 by LogieBaby from very much a surprise for me Many years ago when these PC games came out all were of the junk pile variety and thousands of us players gravitated toward them. A couple years later games became a bit more sophisticated, a good example being the original Ravenhearst. Now with HOPAs available and some being superb, it has been a long time since many players have ever considered a purchase of any game similar to this 5th installment of Vacation Adventures. I rarely even go into the demo. Today I did so and was pleasantly surprised. Were it just hidden object scenes after another I'd surely pass. What appeals to me are finding the critters in each segment and the recycle symbol. These are the same as collectibles to a degree in newer HOPAs. I also found the background guitar music a bit soothing although it would be an improvement if various ditties were employed. I also liked some of the post hidden object scenes with a good example being the one where certain varieties of trees need identifying . \ I have a bunch of free game codes so I just might acquire Park Ranger 5. For brand spanking new players and for those who generally feel the same as me about this sort of game, I suggest completing at least the trial. Rated 3 out of 5 by drnbss from too short great game, good mix but way too short. Rated 3 out of 5 by mapakop from Boring object game This game was just like the others . It was way to easy. Good game for children. Rated 2 out of 5 by artmomto5 from Please no more in this series I made the mistake of buying 3 of these games without trying them first. They are so boring with no challenge or story. I won't be buying any more of these.